Taste test: These are good chips, with lots of flavor. They're ordinary potato chips with a lot of seasoning, and they sort of taste like barbecue chips, with cheese as an extra add-on. As you eat more of them (and as the slogan says, it's hard to stop) you notice the cheese flavor a bit more. Smell test: Sort of cheesy. 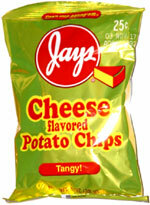 This snack was discovered by Marlo in Chicago. Review published .